Real estate has become an extractive industry, mining the air for property. Space is the essential raw material for building, and virtually every square foot of ground in New York City has been exhausted. With the last of the city’s green fields long since occupied, “growth” has become synonymous with density, and to gain more ground, real estate has become an extractive industry, mining the air. Property, however, has historically been measured only in two dimensions, as a piece of the earth’s surface, typically calculated in square feet or meters, acres or hectares, miles or kilometers. This seems straightforward, but the vertical dimensions of ownership confuse things. Consider the issue of access to what lies beneath, such as petroleum (where the possibility of horizontal drilling remains contentious) and minerals (likewise). Matters are made more difficult by the presence of a variety of subterranean infrastructures, from sewers to subways. But the presumption has been that anything dug up or sucked out within the perimeter of your property is yours. The question of ownership of the space above the surface was codified in the medieval formulation Cuius est solum, eius est usque ad coelum et ad inferos: “Who owns the soil also owns up to heaven and down to hell.” The principle remains an effective legal foundation for the determination of property’s verticality, but the simplicity of the concept has been undermined by transformations in technology and urban form. It seems that the first conversation about air rights was prompted by the birth of aviation: initially by the balloons passing overhead in late eighteenth-century Paris, and later by the arrival of low-flying aircraft. Arguments about the height of the heavens have arisen from issues of trespass, privacy, danger and nuisance. 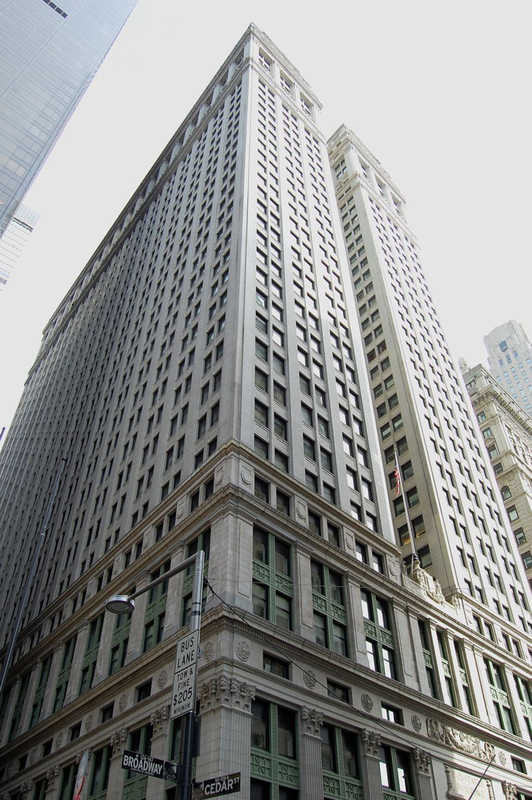 The signal event in the invention of the modern concept of air rights was the construction, in 1915, of the Equitable Building in lower Manhattan. Rising 538 feet, it was the largest office building in the world at the time, dwarfing its surroundings. The Equitable also cast an enormous shadow that prompted the city to draft its seminal zoning code of 1916, which imposed a system of setbacks from the curb for tall buildings so that sunlight could better reach the street. This, at a stroke, created a special value for air—for the void—that restricted the absolute capacity of a developer to occupy the space above the plane of ownership. The public right of access to sun and air was held superior to the uninfringed right to build ad coelum. The regulation of building form specified by the 1916 code was, in many ways, an extension of a decades-long struggle for tenement reform. That fight had prompted a series of changes in the city’s building regulations, with sanitary systems, fenestration and fire protection being progressively modified to provide natural light in every room, plumbing on every floor and at least two means of fire egress. By the end of the nineteenth century, government had asserted a purview over the form, use and performance of buildings and spaces in the city, one that required the compliance of private interests and restrained their right to develop properties without restriction. The city’s zoning regulations were extensively rewritten in 1961, largely to reflect the architectural fashion of the day. The changes introduced a new instrument—something called the “floor area ratio,” or FAR—for measuring property rights and balancing them against the public interest, not simply in day lighting but in density. FAR is a widely used multiplier that specifies how much volume can be built on a given site. For example, on a hypothetical lot of 100 square meters with an FAR of 2, a building with a total area of 200 square meters would be permitted. However, even with this change, zoning continued to stipulate a formula meant to guarantee that sunshine would reach the street and that specified the uses permitted on a given site (indeed, the law saw a huge increase in the numbers of use and bulk categories). The most dramatic transformation to the city’s skyline was the disruption of the celebrated “wedding cake” profile of tall buildings by a new style of towers; set behind plazas and rising without setbacks, they made a controversial break with the convention of uniformly aligned street walls. The 1961 changes also opened up fresh speculative territory. One involved air rights, a measure of the difference between the bulk of the existing building and what zoning permits. FAR functions as their gold standard, regulating the amount of air in circulation. FAR is a form of pure wealth, its exchange value floating free of actual utility. The city has pursued a series of policies that commodified FAR in transactions of alleged public benefit, a crucial speculative moment in the invention of the culture of the “public-private partnership” that has come to dominate planning in New York. Two concepts underlie the monetization of FAR: bonus and transfer. With a bonus, the city grants the right to add bulk beyond the underlying zoning, and it is typically offered in exchange for some nominal public good. This swap has generally turned out to be a rum deal for the commonweal. Witness the scores of vapid mini-plazas in Manhattan, the work of developers seeking to outclass each other in their pursuit of maximum benefit for marginal improvement. Bonuses have also been given to induce development in areas thought to be in need of stimulus. The rehabilitation of Times Square and the west side of midtown were induced by tactical “upzoning.” The latest bonus gambit is so-called “inclusionary” zoning, in which additional bulk is offered if the developer includes “affordable” housing as part of the project. As this bonus is strictly elective, it has produced only modest results. Mayor-elect Bill de Blasio has suggested that he will make such inclusion mandatory, which could be a crucial step in rebalancing the city’s housing stock, if he can follow through. A more promiscuous mode of trading in air is the transfer. The concept is that many lots are not built to FAR capacity and that this surplus can therefore be measured, sold and reallocated to another lot. Historically, the distance over which this surplus value could be transferred has largely been limited to the block on which it originates. However, the Bloomberg administration has been open to a far greater fungibility of these rights, which were central to its increasingly desperate efforts to upzone the seventy-three-block area around Grand Central Terminal. The plan would have effectively created an air bank into which the unbuilt and unoccupiable areas above local landmarks (such as St. Patrick’s Cathedral, Central Synagogue and Lever House) could be deposited and presumably sold at the market rate, driven by its inherent scarcity. The mayor withdrew the proposal in November when he realized that its defeat in the City Council was imminent, but it is likely to re-emerge in modified form. The Furman Center at New York University has done what seems to be the only substantial research on the net potential effects of the rezoning. In several reports, it suggests that the final result is a substantial gain in the city’s buildable volume, which, of course, was the primary motivation of the policy—part of the administration’s efforts to reconfigure the city to house the additional million inhabitants it believes will arrive over the next decades. And by relying on FAR to increase the total volume of real property in the city, the Bloomberg administration has supported the industry with which it has the coziest ties and to which it owes the most fealty. There is also a trend among certain academics and public planning intellectuals—Edward Glaeser of Harvard being the most prominent—to theorize density as planning’s most important principle. The new school of close-packing argues, not without reason, that density induces sociability; that dense cities are more fundamentally sustainable; that by making room for more residents, density increases tax revenue, allowing an increase in municipal services; and that the suburban alternative which has been our national model since World War II needs to be revamped. Let us stipulate that all of this is so. The problem with the close-packers is that they tend to treat the idea of density as an absolute, leaving unexamined not so much what justifies density but what should limit it. At the end of the day, density’s rationale must be something other than the idea of maximizing economic returns for those in a position to benefit from such development. It is true that certain values—historic patterns, landmarks, social ties and other conditions that fall under the rubric of “context”—also form part of the equation, but I wonder if there are not more fundamental standards that might be invoked for establishing the value of urban air. To begin, the importance of sunlight and clean air in the prevention of asthma, depression and other health problems remains salient. With this in mind, what might be the effects of tying buildable area absolutely to housing reform, the availability of open and green space, and a more capacious interpretation of zoning? What if there was a formula by which the area of parkland were to become the gold standard for the production of bulk? At the moment, there is a multiplier of very roughly four or five in the relationship of habitable floor area to park acreage. New York remains one of the best-served cities in the nation for park space (and Michael Bloomberg deserves kudos for his efforts as mayor to expand and enhance the parks), but no policy exists for linking built density with the corollary necessity for relief, save in the zoning legislation designed to guarantee that sunlight finds the street. By tying new density to new open space and by including a calculus of proximity, a more cogent vision of good city form might arise. An abominable vision of the current system gone wild is “Billionaire’s Row,” a phalanx that includes Empire State–sized hyper-luxury high-rises going up on 57th Street. On winter days, some of these buildings will cast shadows a mile long onto Central Park, a pall created by limited environmental controls on the effects of air-rights transfer, which mainly take the form of district preservation or contextual zoning that specifically limits building heights. The same conundrum is at the heart of the legislation just signed by Governor Andrew Cuomo for the transfer of air rights from Hudson River Park (technically, from the developable pier space within it) across the West Side Highway, where they will be sold to permit the construction of high-rise waterfront towers. The revenue would finance the completion and maintenance of the park, much as has been done with the High Line. While there is nothing theoretically wrong with collecting public revenues from private uses—this is how the whole system works, after all—there are problems with the limits of the transfer and with the way it reinforces social stratification. The daisy chain of public amenity adding value to private holdings is simply too specific and too unregulated by any theory of the value underwriting the trade-off. The legislation dumps a strict regulatory regime for a bonus system and sidelines a progressive definition and enforcement of a set of public goods and rights for a system of exchange in which one public good is swapped for another. Certain benefits (affordable housing) are implicitly rated greater than others (access to light and air). But exactly whose ranking is this? The only real baseline for it is profit. Creating FAR is the urban equivalent of printing money, and the Department of Planning (which wags refer to as the “zoning store”) functions as the Federal Reserve, manipulating supply. But these decisions risk being haphazard and opportunistic if they are not founded on a broad, firm set of formal principles and ambitions that arise from community needs, vivid imagination, a keen sense of what constitutes a good city, and an abiding struggle for real equity. The formal medium by which these conflicts should be resolved, and a comprehensive vision of public interest in the city advanced, is a plan. As the urban planning professor and activist Tom Angotti has noted, New York City’s planning department has never actually produced a plan (the last effort, in 1969, was never adopted), engaging instead in a particularly narrow, highly quantitative version of planning—one that wields the power to zone as its principal instrument and considers an increase in both the amount and ease of development as its main motives. The city’s PlaNYC2030, for all its excellent suggestions, was produced in 2007 with only minor input from the planning department and has never been vetted or approved according to the process set out in the City Charter, giving it shaky legal standing. It was prepared by the Economic Development Corporation (which Angotti describes as “the mayor’s proxy in negotiating deals with developers”) and based largely on the work of the management consultants McKinsey and Company. It is thus not the city’s plan but Mayor Bloomberg’s, and he’s about to leave office. De Blasio’s positions on many major planning issues remain unclear. In the past, he has supported controversial projects, including the Atlantic Yards and the Greenpoint-Williamsburg redevelopment. But those who voted for him were surely moved by his commitment to use the powers of his new office to dramatically narrow the city’s obscene income gap, and to reinforce the operation of governance as a means to promote social justice rather than the trickle-down ethos of the Bloomberg era, so decisively rejected by voters. De Blasio has the opportunity to institutionalize the best elements of PlaNYC 2030 and bring it into the community-empowering framework embodied in the 1989 charter revision. Planning must replace zoning, and community voices must speak louder than those of autocrats and plutocrats. The great motto of the Hanseatic League was Stadtluft macht frei: “City air makes you free.” It’s time to free our air.